Slotastic has just added a new game to its recently upgraded mobile casino and they've given five more of their mobile slots a big technical catch-up. The pirate-themed Ghost Ship slot from Realtime Gaming is now available for smartphones and tablets. Enchanted Garden II, Lucky 8, Loch Ness Loot, Samba Sunset and Santastic now look and play even better in the mobile casino. 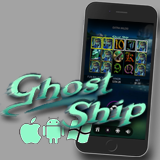 The mobile version of Ghost Ship has all the online game's best features, like the Expanding Wild and Free Spins bonus. Three or more Scatters – an eerie Ghost Ship – trigger free spins. Two free games are awarded for each Ghost Captain or Ghost Ship anywhere in the triggering spin. During free games, Ghost Captain Wilds expand to fill the entire reel they appear on. They also fill any reel a Scatter appears on. You can win up to 10X multipliers during free spins! There's a Major and Minor jackpot that can be triggered randomly after any spin. Five mobile casino games from RTG get upgrade. To keep up with ever-improving mobile technology, Slotastic’s mobile casino has recently had a huge technical overhaul. Five games that we've been enjoying in the mobile casino for awhile now have just been upgraded. Enchanted Garden II, Lucky 8, Loch Ness Loot, Samba Sunset and Santastic now take advantage of all the new design and interface features that make the newer RTG mobile casino games so easy and fun to play on Apple and Android mobile devices. Slotastic is adding a new game to its mobile casino every month or so. Cash Bandits 2, a sequel to the popular bank robber slot from RTG, arrived earlier this month in the download, instant play and mobile casino.